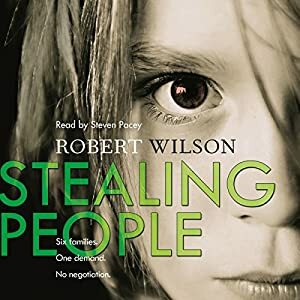 Just released, Steven Pacey reads Robert Wilson’s crime thriller Stealing People. London, January 2014. In the space of 32 hours, in a well-planned and highly organized operation, six billionaires’ children are taken off the streets of London in a series of slickly well-executed kidnaps. The gang demands £25 million per hostage for “expenses” – not ransom. And when your child goes missing, you need Charles Boxer: a man with little left to lose, who’ll stop at nothing to save families suffering what he has. The wealthy parents of the missing children know that Boxer will do more than police can – but that doesn’t mean the law will leave it to him. Intelligence agencies are all interested in the kidnaps because in each case the parents are related to people in power in the various countries involved. Soon the investigation goes beyond the corridors of power and the boardrooms of big corporations – and to far darker corners. Even more worryingly for Boxer and his ex-wife, Mercy, it threatens to lead back to their own lives, too. But still nobody knows what this mysterious kidnap gang ultimately want, and if they have a cause, what the hell is it?